Place strawberries, sugar and lemon juice in a medium sauce pan. Heat over medium-high and bring to a boil. Reduce heat to simmer and cook until strawberries have softened, about 5-8 minutes. Remove from heat. Transfer strawberries to a blender and puree until smooth. Strain the mixture. Cool. 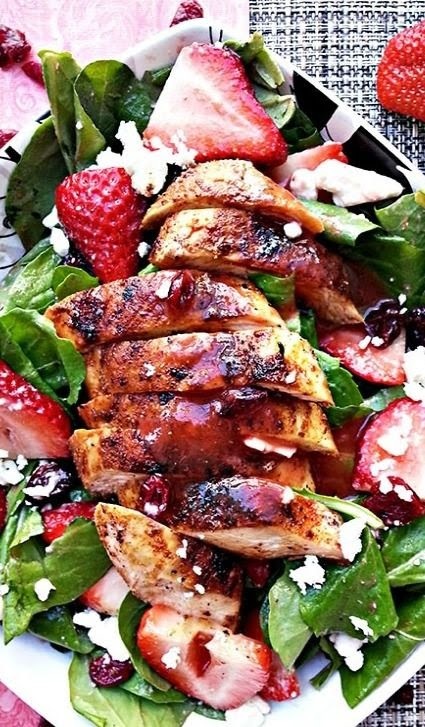 Toss together spinach with feta, sliced strawberries, cranberries and salad dressing. Portion on four plates and top with sliced chicken. Serve.